The greenback slid on Tuesday and the USDCHF pair was trading 0.20% weaker during the London session, seen hovering around 0.9770. 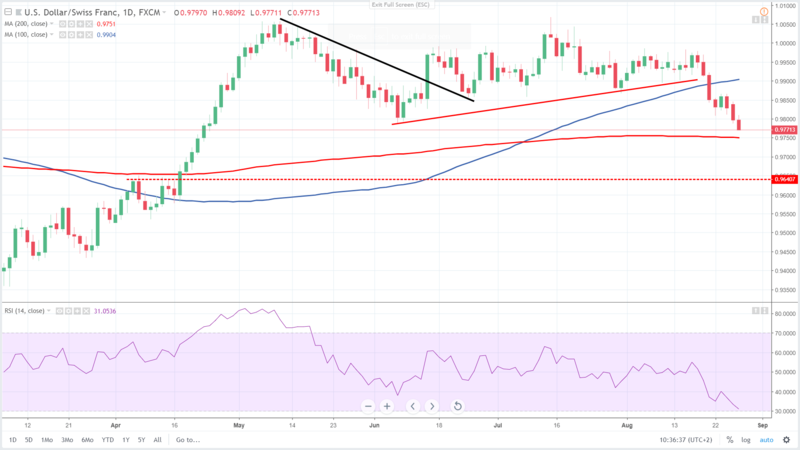 The EURUSD pair managed to get to one month highs as its trading around the 1.17 level, amid positive EU numbers and improving political situation in the euro zone, which in turn pushed the USDCHF pair lower. There are no major data on the agenda and therefore the current anti-dollar mood could persist throughout the day, especially after the latest wave of dovish Trump comments. The price is falling toward the 200 day moving average, which is at 0.9750. This will be the first major support for the pair. If not held, the current bullish trend could end, with the next target for bears around 0.9650. On the upside, the first resistance is at 0.98 and if broken, further rise to the 100 day moving average at 0.99 could occur. The USDCHF pair appears oversold and therefore short covering rallies could occur.